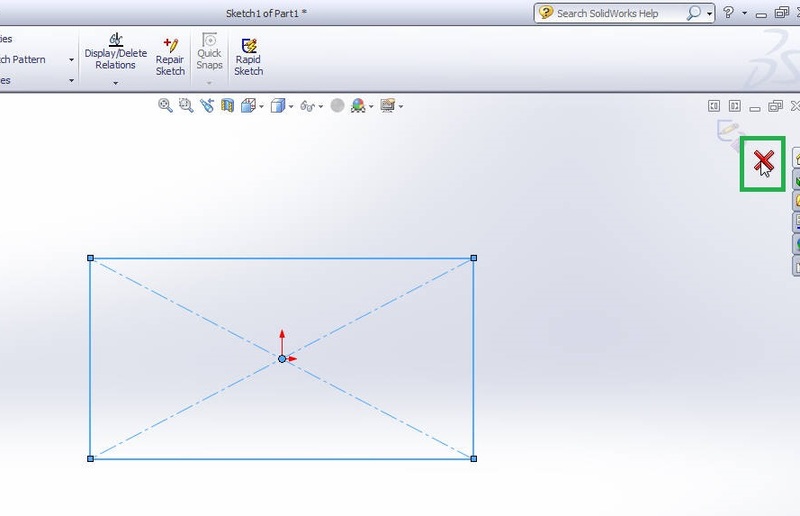 Do you know how to use Extrude Boss/Base feature in Solidworks interface? Extrude Boss/Base is one of the important and very useful tool in Soildworks CAD software to create solid 3D models. It extrudes a sketch or selected sketch contours in one or two directions to create solid feature. That means, if you have closed contour sketch drawing, then you can add materials to that contour and convert it into 3D model. Extrude boss/base feature is mainly located in “Features command manager” or “Insert Menu”. Using the Extrude boss feature, you create 3d models like block, cube, cylinder, 3D polygon, 3D elliptical shapes etc. In this tutorial, shows how to create 3D rectangular block with rough sketch dimensions. Note: This is just tutorial showing how to use Extrude boss or base tool, not showing any product drawing or designing in it. If you are advanced SolidWorks user please avoid it. This Solidworks tutorial is for beginners, students or people likes to learn about SolidWorks. Note: Before using extrude boss/base feature, ensure that your sketch drawing is closed contour, otherwise it shows error. Here you need to create rectangular block of any thickness. You also studied that for creating rectangular block, the base drawing is a rectangle in Engineering Graphics. So, I draw a rough sketch of a rectangle which is shown in the above figure. Here I use a Center Rectangle and select the origin as its center and complete rectangle sketch. “Exit the Sketch” by clicking the Red Cross mark located at top right corner of the graphics interface, as shown in the above figure. Or Clicking on the “Exit Sketch” button from the command manager. Important Note: Before applying any features tools in your sketch, Must exit from the Sketch like as shown in the step 2 image. Before selecting the “Extrude Boss/Base” Feature tool, select the “Sketch 1” from the SolidWorks Feature design tree. Then select the Extrude Boss from the Command manger, by clicking on the button. You can go to SolidWorks “Insert menu”. From the drag drop down menu select the “Boss/Base”. Then a side drop down menu will appear and select the “Extrude” option as shown in the above image. Then the Sketch is convert to a 3D block is shown in the preview image. You need to add the height or thickness of the rectangular block in the extrude boss property manager as shown in the left side bar. At the green marked points you need to enter the value in it. Then click “OK” green tick button marked with red box. Then you can see a 3d rectangular block as shown in the figure. From: The “from” option means the extrude boss application from Sketch plane/Surface/Face/Plane/Vertex/offset. In this you need to set the where you need to start the extrusion. Direction 1 or 2: It controls the extrusion direction in either one or both. Here different options are available such as Blind, Up to vertex, Up to surface, Up to body, Mid-plane and offset from the body. You will see the applications of options contained in boss extrude property manager. Thin Feature: Using this you can convert very thin 3d models having very small thickness. Selected Contours: You can select the needful contours to create 3d parts. Now, you know the Solidworks extrude boss or base option very well and how to use it on Solidworks cad software. In this section you are going to see some features contained in extrude boss property manager such as Draft and Thin Feature. Draft is used to create tapered face as per the set draft angle and it is like SolidWorks Draft feature tool, but limited abilities as compared to it. Thin feature is another sub tool option contained in the extrude boss property manager which helps to make small thickness models. It has ability to convert 3D solid body to small thickness body as set in the thickness section. Both draft and thin feature applications tutorials are given below with YouTube video instructions and step by step pictures. Here I am going to use 3D rectangle solid box created by using Extrude Boss/base tool. First you have to go to the FeaturesDesignTree manager, in which right mouse click on the “Boss-Extrude1” and select the “edit Feature” from the appearing dialogue box. Then you can see the Boss Property manager. In the “Direction 1” section, click on the “Draft On/Off” button to enable and disable the draft tool in boss property. Click one time on the button and the button color will fade away. That means you switch on the draft (Draft is ON). You can also see the “draft angle” set box in the side of the draft button in propertymanager and enter the value of as you needed as draft angle. For example I am going to enter “20 degree” and the draft inward extrude boss is happening and preview shown below. Tick on the “draft Outward” box to change the draft extrusion direction outward , which is away from the rectangle center. In this way you can use the extrude boss draft inward or outward tool. If you want to apply tapering to all faces from sketch plane equally to all sides, this feature is very helpful and save time and storage space by using it. That means as designer, the productivity will improves. Note: Using this Draft tool, you can’t control the each face or edge of the solid model individually. For that SolidWorks CAD software provides the “SolidWorks Draft Feature Tool”. Like applied earlier in the Extrude boss draft property manager tutorial, you can’t apply thin feature to already created model. You have to create new model and you cannot access the feature by using the Edit feature button. So, I again created a 3D cylinder model for showing the THIN FEATURE Tutorial, if you don’t know how to create 3D solid cylinder, watch the above solidworks video tutorial which explains it by step by step manner. Note: Do not close the “Extrude boss property manager” after creating the cylinder and your graphics area look like this below in image. Go to the boss property manager which is present I the graphics area and click on the “Thin Feature” side box to enable it. Then you can see the thin feature tools options like different direction, thickness in mm and cap ends option also. When you enabled the thin feature, you can see the preview of the set thickened hollow cylinder. But you need to apply direction of application of thin feature. Three direction options are available such as one direction, mid-plane and two directions. If you select “one direction”, set thickness will added in one direction only, either towards the center or away from it. You select the “Mid-plane” as the direction; the application is equal in both direction as per your set thickness. If you are increasing the thickness, it equally added to inner side and outer side. The two direction option, you can see the two thickness entering box and you can separately set the inner and outer sides. Click on the green tick button in the extrude boss propertymanager to obtain the finalized design or model. This way you can create small thickness models in simple way and for complex shapes also it can be applied. But one of the disadvantages is that thickness is throughout uniform. No control over the thickness in various points. You can also see the SolidWorks Shell feature tool, which is gives similar result like thin feature, but multi-thickness application is possible with shell feature. I think you guys got an idea of Solidworks extrude boss and additional feature tool like draft and thin feature contained in the boss property manager. If you have any doubts feel free to comment me and share these Solidworks tutorials to your friends also. Thank you friends and see in next solidworks tutorial. I hope you enjoy the SolidWorks tutorial. You can ask any doubts, questions or tutorial request through the comment form. Thank You.